Atherosclerosis, angina, and heart attack aren’t the only types of heart disease. Following are brief looks at four other common types of heart disease — arrhythmias (rhythm problems), heart failure, stroke, and heart valve problems. Arrhythmias (or dysrhythmias) refer to problems with the electrical system that controls the heart’s normal rhythm. They may occur in the context of an acute heart attack or from other causes. When the electrical system goes entirely haywire, it may result in a very dangerous condition called ventricular tachycardia, which occurs when an abnormal electrical impulse causes the heart to beat so fast that it cannot pump out adequate blood. This condition can rapidly degenerate to ventricular fibrillation, which occurs when the heart simply quivers and produces no blood flow. Ventricular fibrillation must be immediately terminated by an electrical shock, or defibrillation, administered by a medical professional. The atria, the upper chambers that assist the ventricles, can also have rhythm problems. One of the most common is atrial fibrillation. Atrial fibrillation occurs when electrical signals are chaotic, and muscles of the atria quiver rather than contract. The electrical impulses also reach the ventricles very erratically, thus producing an erratic heartbeat. This condition is common in individuals who have heart disease and can be caused by a variety of conditions including coronary heart disease, hypertension, and an elevated thyroid level. Atrial fibrillation, by itself, is not immediately life-threatening. But because the atria are not contracting effectively, they can gather clots that can pass through the heart and into either the brain, potentially resulting in a stroke, or the lungs, potentially resulting in a very serious condition called pulmonary embolism. Because of the possible outcomes, treating atrial fibrillation aggressively is important. Treatment may include medications and/or cardioversion (an electrical procedure that restores normal rhythms). In addition to medicines to control the heart rate, all patients who have atrial fibrillation must take blood-thinning medicines (anticoagulants) to lower the risk of blood clots generated in the atria being thrown to the brain or lungs. Heart failure occurs when the heart no longer adequately pumps blood to the lungs and throughout the body. It usually is a slow process that takes place during a period of years. Underlying conditions, such as CHD, leakage from one of the heart valves, an acute heart attack, or various diseases of the heart muscle itself usually cause heart failure. The heart may try to compensate in these ways for years before you notice any symptoms. But when these mechanisms ultimately fail, significant heart failure occurs. By then, compensatory mechanisms often have become part of the problem. How serious heart failure is depends on how much pumping capacity the heart has lost. A normal heart discharges about 60 to 75 percent of the blood in the main pumping chambers with each contraction, or beat. Heart failure often occurs when the amount of blood ejected per beat, called the ejection fraction, drops below 50 percent, and when the ejection fraction falls below 40 percent heart failure ensues. Even so, many people can survive for many years with ejection fractions of only 20 to 30 percent, or sometimes even 15 percent. All forms of heart failure are serious health problems that require medical treatment. Taking care of yourself, seeing your physician regularly, and paying scrupulous attention to recommended treatments including lifestyle modifications are important steps you can take to improve your chances of living longer. Fortunately, many effective treatments are now available for heart failure and experimental procedures such as stem cell therapy are promising. A stroke occurs when a blood clot or bleeding suddenly interrupts the flow of blood to an area of the brain. When deprived of blood, brain cells lose their ability to function and, if deprived for too long, die. Because brain cells and groups of brain cells have highly specialized functions, the location of stroke damage determines what loss of neurological and bodily function occurs as a result of stroke. Impairment may be temporary or permanent. Strokes are categorized in two basic ways: ischemic stroke and hemorrhagic stroke. The causes and results of stroke depend on how and where the stroke occurs. An ischemic stroke occurs when a blood clot or other particle blocks a blood vessel in the brain and cuts off the blood supply to the portion of the brain supplied by that vessel. Without adequate oxygen, that portion of the brain suffers damage or even dies. This type of stroke is called an ischemic stroke because it’s caused by ischemia, the medical term for lack of blood flow. Cerebral thrombosis: This form of stroke results from progressive narrowing of arteries in the brain or sometimes in the carotid arteries in the neck. In a thrombosis, plaque (there’s that cholesterol again) that narrows the artery and any clot (thrombus) that forms on it doesn’t move, meaning the typical underlying causes for this type of blockage are atherosclerosis and high blood pressure. Cerebral embolism: This form of stroke occurs when a blood clot, or embolus, travels from somewhere else in the body to the brain. When the blood clot lodges in a vessel in the brain, it cuts off blood flow to the portion of the brain supplied by that vessel. A hemorrhagic stroke occurs when a blood vessel in or on the brain bursts and bleeds into the brain or into the space between the brain and skull. This type of stroke is called a hemorrhagic stroke because it’s caused by a hemorrhage (in Greek, hemo means “blood” and rhage means “to break”). The brain is very sensitive to bleeding and pressure, which damage brain tissue, often permanently. Hemorrhagic strokes account for only about 20 percent of all strokes, but they usually are more severe and more often fatal than ischemic stroke. The four heart valves serve as traffic cops of the heart, directing blood flow in the proper direction and preventing it from improperly backing up. As long as these valves open fully and shut tightly, all is well. But if any disease or injury causes valve leakage (regurgitation) or narrowing (stenosis), major problems can result. Significant valve leakage can overload the heart because extra blood flowing back into the heart requires an extra strong beat to eject it. A narrowed valve can cause the heart to thicken because it is being asked to pump against a much higher pressure. 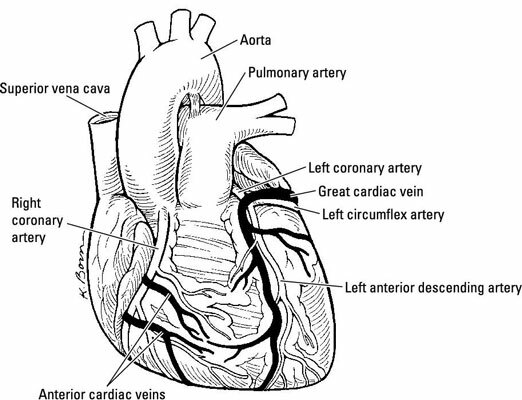 Congenital valvular problems (a condition you’re born with). Damage to valve structures, such as when the structures that anchor the flaps of the mitral valve break. Heart attack can also seriously damage the muscles that control the valves. Progressive problems, including those that may result from the aging process, such as calcification, or those that result from an infection, such as rheumatic fever or endocarditis. If the problem becomes too severe, it may require open-heart surgery and valve replacement. If a valve abnormality is not progressing rapidly or causing any serious problem, your physician may simply keep a close eye on it so that treatment can be initiated when and if it becomes necessary. Following a heart-healthy diet and lifestyle can also support valve health. Taking preventive antibiotics as needed when you have an underlying valve abnormality is a good idea. There are also various medical and surgical treatments for valve problems.